Adriatico’s Pizza in Clifton – Go There. Try That. I could eat pizza every day. Seriously! I know I shouldn’t, but I could. No two pizza pies are the same, so technically, it’s different. I’m also one of those crazies who enjoys leftover cold pizza the next morning! If I had to pick my favorite pizza place in Cincinnati, it would be Adriatico’s in Clifton! It’s local. It’s independent. It’s delicious. I first had Adriatico’s years ago when a friend ordered it for a party. Their first location, also in Clifton, was a tiny take-out only place. I’m certainly glad they opened their first dine-in restaurant! If I lived a little closer, I’d be a regular with my name carved in the back of a chair. Cliff? Norm? Love the open window seating! 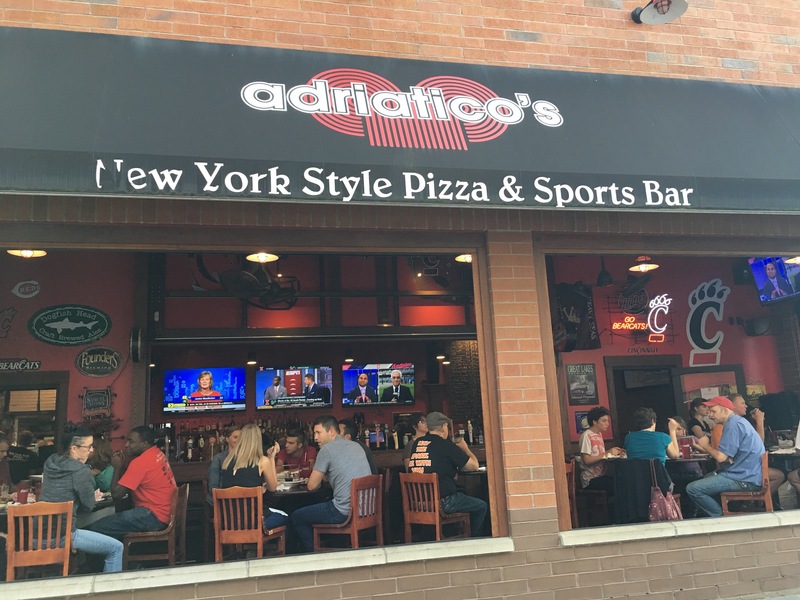 I’d say Adriatico’s is most known (and loved) for the Bearcat Pizza; it serves about 12 people so it’s perfect for game days and big groups! Massive, the Bearcat has edge-to-edge toppings, is cut into squares, and served Sicilian style. While I do enjoy the Bearcat, I’m not a super fan of thick crust, so I always order the hand tossed. It’s the perfect balance for us because I like thin crust pizza and my husband likes thick. And, we all know that crust is critically important. Adriatico’s crust has a really nice garlicky flavor! What I appreciate even more is the sauce; I don’t know what’s in it, but it’s a little bit sweet and a little bit spicy. It’s thick and hearty. So good. But what do I crave? The toppings! The pepperoni is the size of silver dollars. Huge. The sausage is my favorite in the city, easily. It’s crispy on the outside and has just the right amount of spice. It’s fresh and filling! There’s no skimping on toppings at Adriatico’s. Then there’s the cheese. The thick layer of mozzarella that stretches, warm and gooey, with each bite. I also love the brown bubbles around the edges from being baked just the right amount of time. My fave: traditional crust topped with pepperoni, sausage, and onion. Sometimes, you need to add peppers and mushrooms to the mix! Adriatico’s also boasts an interesting beer menu. Lots of selections from local breweries and a wide range of options. They have way more craft and local brews than domestic. If you care more about dessert than drinks, and you aren’t too full from pizza, Adriatico’s serves about twelve different flavors of gelato. While I haven’t personally tried it, I’ve been told it is delicious. P.S.- Columbus friends! I just found out there’s a location for you at 265 W 11th Ave! Tip: Street parking is hard to find; check out the parking garage just up the street. GO THERE (Adriatico’s Pizza)! TRY THAT (Pepperoni and Sausage)!